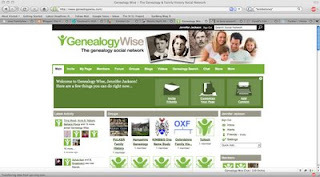 A new Social Networking site, Genealogy Wise has emerged onto the internet scene within the last two days. It is the specifically geared towards connecting genealogists and family historians. It has many of the features of other social networking sites including application, and photos, but it also incorporates blog posts, groups, forums, a chat room, a store, and even a genealogical search engine which is connected to World Vital Records, to name a few. Participation in Genealogy Wise is free, but the genealogical search requires a fee to actually visualize the records. This website looks to be promising and could be a great asset to the genealogical community. It has been fun connecting with some of my online friends through this forum. I am sure that I will make new friends through this venue and hopefully will be able to connect up with some of my distant cousins. If you have never ventured forth into the social networking sites such as MySpace or Facebook, this site might be just your ticket if you are a genealogist or family historian. It is specifically geared to genealogy which is great and it is free to join. If you would like to check it out click Genealogy Wise. Have fun!! There certainly seems to be a genuine interest in signing up at Genealogy Wise. I guess it's a wait-and-see situation as far as how active a community it will be. Thanks for finding me so fast. Perhaps you'd like to join the Genealogy Bloggers Group at BlogCatalog. All genealogy bloggers are welcome.